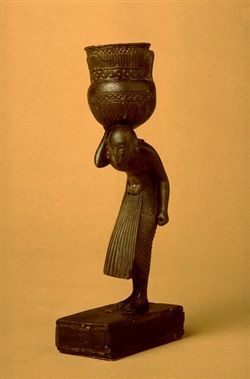 The figure is in the form of an elderly male, presumably a servant and perhaps a Nubian,dressed in a long pleated kilt, bent double under the weight of the pot carried on his shoulders and held up by his right arm. The pot is a wide-mouthed, chunky krater, with two long vertical handles, and is decorated in carved bands of checkerboards, circles and lotus leaves. The shoulder of the pot is not decorated, nor is the footed base. The pot is hollowed out inside, but there are no traces of any original contents. Originally there was a lid, perhaps of a different material such as ivory, and there is a hole for the peg or pivot on top of the rim. Piotr Bienkowski and Angela M.J.Tooley., Gifts of The Nile: Ancient Egyptian Arts and Crafts in Liverpool Museum., 1995., 53; pl.74. Revue Archeologique, 1907, Pl. XVI.